A 100 percent unique material - Sorbothane® isolates vibration and damps undesirable noise in consumer and commercial appliances. Sorbothane® elements are instrumental in reducing the noise level of high-end commercial blenders, allowing for front-of-house placement and usage. Video cameras rest on anti-vibration Sorbothane® mounts to protect picture clarity in any environment. 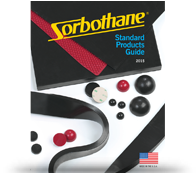 Audiophiles worldwide recognize Sorbothane® as the premiere material for cancelling vibrations that adversely affect audio and video performance. Sorbothane® audio isolation feet remove the muddying effects of vibration from the signal chain – resulting in cleaner, purer audio and video. See samples of solutions we’ve provided to the Consumer & Commercial Products industry.